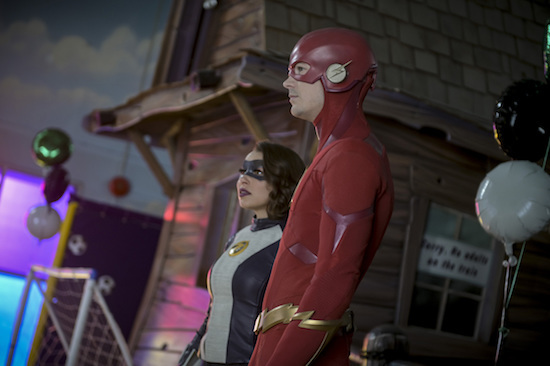 THE FLASH: I give the show credit for shaking up the normal villain format, but the second Cicada really isn’t working for me yet. The original Cicada at least had the quasi-basis of love his ridiculousness. This new Cicada doesn’t seem to care about logic and is just barreling ahead, which isn’t as compelling. Hopefully they can give her more layers going forward. I’m glad Barry and Iris know the truth about Nora, but I was not expecting Barry to immediately turn on her and lock her up. That’s not going to end well. MASTERCHEF JUNIOR: Uh, can the home audience get a taste of those final cakes? MENTAL SAMURAI: The difficulty with a new show like this is how you properly showcase everything while not boring your audience. Having people get knocked out after one question really should have been held until later in the run. I get the point could be to show how hard it is, but it took until the second half of the episode for a contestant to make it to the final question of the first round—and the poor woman still got it wrong. Yes, the final contestant made it past the first round, but you’re betting a lot that people will stick around 50-plus minutes. SPLITTING UP TOGETHER: The slow-burn of Lena and Martin’s kids being kept in the dark about their half-sister is an interesting choice. On one hand, it’s not helped by the show’s erratic scheduling—a partial side effect of the real world—but it also feels like a disservice to drag it out. The younger kids should be upset that not only did their parents keep this big news from them, but their sister did, too. But I really, really love Lena and Lisa’s relationship. I’m so thankful they’re not making it catty, petty, or any kind of competition. THE ROOKIE: It was compelling to lose Andersen, but it also really, really, really feels like a waste. On one hand, Andersen was wildly underutilized, to the extent that I wondered if they’d find a way to write her out or bump her to recurring next season if/when the show gets picked up. THE VILLAGE: These shows are often hard to get right, because if it dives too deep into emotions and twists, it can feel contrived and artificial. I liked this pilot. Yes, there’s a lot going on, but the built-in drama with Nick and Sarah intrigues me. It’s going to be a mess—as is Patricia’s health crisis. But I was drawn into the characters and hopefully the show can keep a good balance of authenticity as it goes forward.